We’re getting older and our vision isn’t as clear as it once was. As we stare down the existential barrel of our perpetually shrinking lifespan, our doughy, sagging bodies are slowly degrading back to the dust from which we were birthed. The lenses of our aging eyeballs are becoming harder to focus by the day. Don’t even get us started on our aches and pains. Oy vey. The point is, small screens give us a darn headache. We never understood why our parents would spend their evenings squinting at the TV screen. Now we get it. Thankfully, we have more options than our parents ever had. The big question is: do we get a projector or a bigger TV? Why would we want a projector when we could get a perfectly good television and not have to worry about lenses and bulbs? Well, there are a few good reasons. First off, unless you’re some sort of crazy billionaire and have enough money to buy mega-sized displays, there is no way you’ll be able to afford a 100” TV. To put it in simpler terms, 100” 4K HD TVs cost right around $20,000. On the other hand, even budget priced projectors can produce a screen size of 100” and higher. Second, projectors are simply much more portable. If you want a 100” screen that you can carry in a handbag, a projector is your only option, unless you’ve invented some sort of folding TV display that we’ve never heard of or seen before. 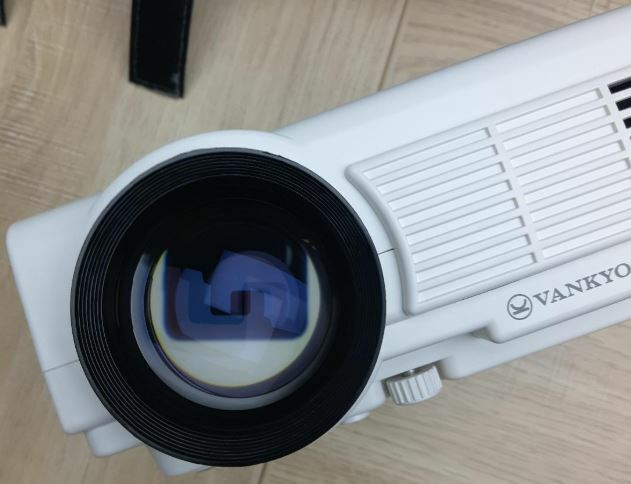 When we came across the Vankyo Leisure 3 projector on Amazon, we were instantly stunned by the device’s 4.8-star average rating and very affordable price. Could this be the projector we’ve been waiting for? We’re always hesitant when the Amazon reviews look too good to be true, because more often than not… they are. Many budget electronic companies have taken it upon themselves to pay for reviews or give away free products in return for a 5-star review. Review fraud is an unfortunate fact which makes shopping for electronics a tricky experience. So obviously, we had no choice but to test out the Leisure 3 for ourselves. Over the past few weeks we’ve used Vankyo’s projector as our primary display gadget, taking notes on the device’s performance. Here is our honest review of the Vankyo Leisure 3. The Leisure 3’s packaging reminds us of laptop packaging, complete with a plastic handle. 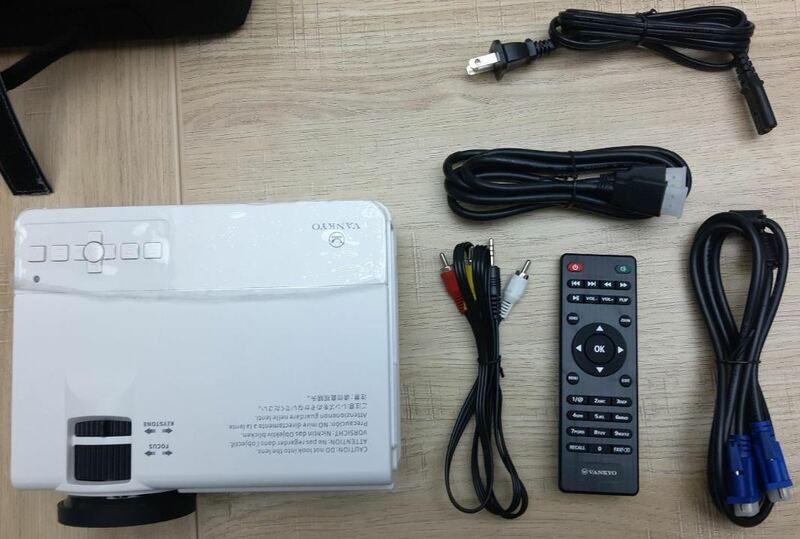 Included in the packaging is the projector, a carrying bag, an HDMI cable, power cable, 3 in 1 AV cable, VGA cable, remote control (batteries not included), quick start guide and user manual. Our first thought was that for a product marketed as a mini-projector, it’s not as mini as some of the other projectors we’ve seen. 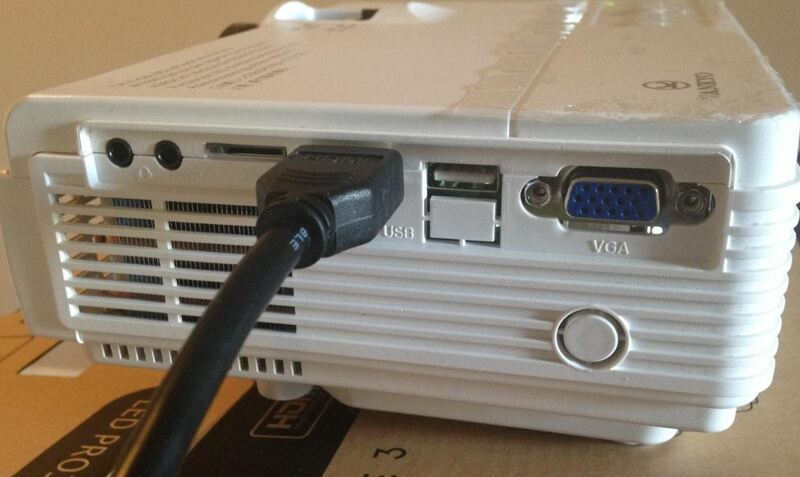 If you consider how large movie theater projectors are, and many home projectors as well, the Leisure 3 is miniature. The Leisure 3 measures in at 7.9 in. x 5.9 in. x 3.1 in. with a weight of 2.1 lbs. Clearly, very small, but not exactly miniature either. 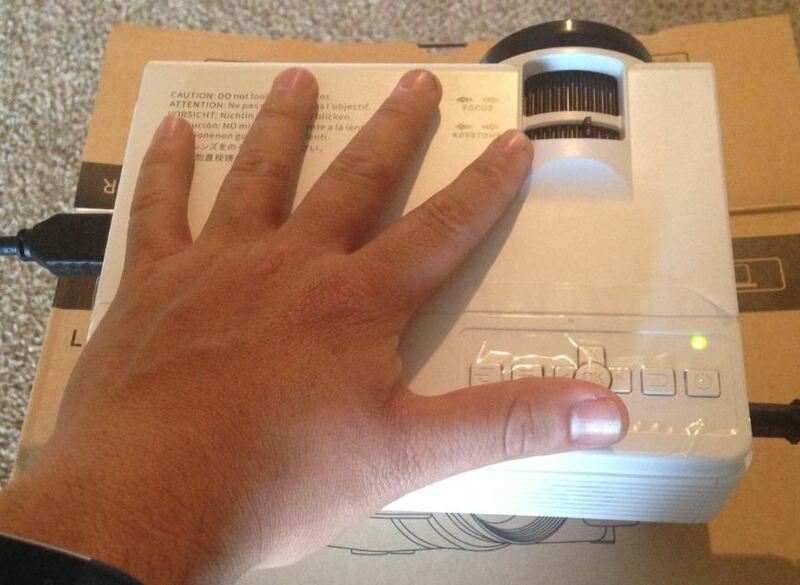 When we see a projector with a sub-$100 price tag, we immediately become a bit skeptical. There’s a certain amount of hardware that must be included to produce a satisfactory picture, and from our experience, the required specs usually fall by the wayside once the price tag approaches that $100 mark. The Leisure 3 doesn’t contain top of the line hardware, but Vankyo has engineered the device in such a way that every single bit of performance is pleasantly squeezed into a tasty projector-flavored puree. The Leisure 3 supports full HD 1920 x 1080 resolution, powered by the MStar Advanced Color Engine. 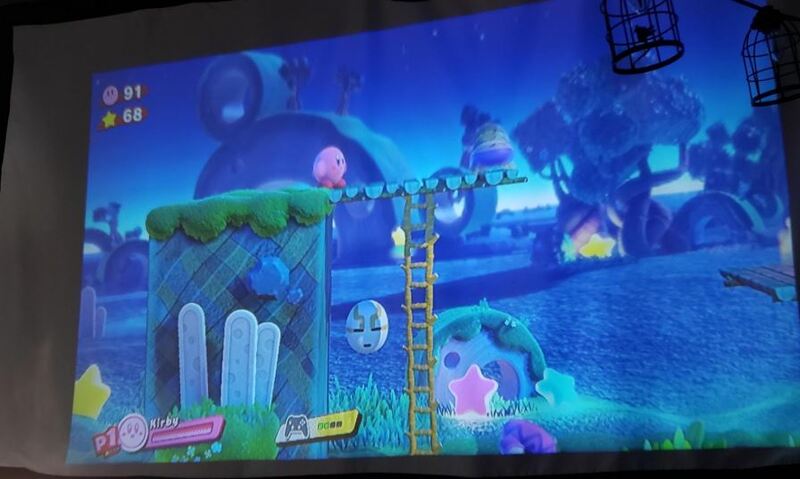 The engine does a fantastic job of making the projector’s native resolution of 800 x 480 look a lot better than it actually is. The resolution upscaling is stunning, way more color accurate than we ever would have guessed. We didn’t notice any significant artifacts or blurring, which can be a problem for engines that can’t handle higher resolutions. When you hear that your newly purchases has a native resolution that’s about 15 years past its prime, a tiny bit of buyer’s remorse is understandable. Let’s make something very clear. This projector looks way, way better than what the specs may lead you to believe. The darks and blacks are often the most distracting issue we notice when a device has cruddy resolution. The Leisure 3 features low-lights that are crisp and well-contrasted. The colors are more vibrant than you would expect out of an affordable mini-projector and action shots look smooth with no trailing or blur. The Leisure 3 has a picture size range of 32” to 170”, which is achieved with a projection distance between 5 ft. and 16.5 ft. away from the screen surface. Vankyo suggests that the sweet spot is a distance of 6.5 ft. away, which we’d have to agree with. We feel that at 170”, the hardware is really getting stretched past its limitations. At that screen size, the picture has clearly degraded and the image is beginning to blur. We figure that the maximum sweet spot is about 120”, with anything over that resulting in a less vibrant picture. We want to start this section off with a little disclaimer, since this might be a deal breaker to some of you: the Leisure 3 does not natively support Dolby sound. From time to time you’ll notice that your video source isn’t playing any audio. This is very likely because the sound is Dolby Digital. To get the sound to work, you must go into the source’s settings, whether it be a Roku, Fire Stick, Apple TV or what have you, and turn off the Dolby Digital setting. Besides the Dolby faux pas, the Leisure 3’s native sound isn’t too shabby. Much like any projector, you’re likely going to want to invest in a stand-alone surround sound system, because the quality is incomparable, but if the sound system isn’t in your budget now, you’ll be fine with the on-board speaker. 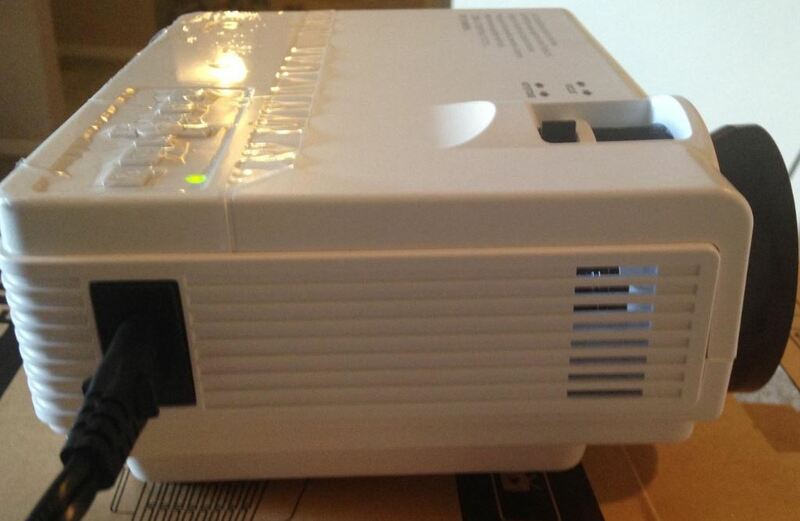 Mini-projectors are not as bright or vibrant as HDTVs. It’s just the nature of their hardware. The lighting source of HDTVs is right behind the display. As a result, the light does not diffuse as much as the light created by a projector’s bulbs. The Leisure 3 comes equipped with 1800 lumens, which is great if you’re not planning to have the projector more than a couple yards away from screen surface. We don’t want to suggest that the device’s illumination makes it unusable. That would be nowhere near the truth. It might not be as bright as a modern HDTV, but it’s certainly bright enough, which is important when you’re dealing with a 100” screen. If you’ve never owned or used a projector before, you’ll know that you might want to consider where and how you’re planning on using the device. Projectors have much better visibility in low-light settings. Since the Leisure 3’s luminescence is on the lower-end, you’re going to want to use it in a room that is as dark as possible. The device will still work during the day, and you’ll still be able to make out a sharp picture, but the contrast and brightness is much better when used in a room with good light insulation. The lamps have a lifespan of right around 40,000 hours. If you’d like to make sure the lamps hit their maximum age, Vankyo suggests giving the bulbs a break every 3-4 hours to avoid overheating. This is par for the course as far as projectors best practices go. One of the things that impressed us the most about the Leisure 3 was its fan suppression system. Projector cooling systems can be annoyingly obtrusive for people who are easily distracted. In fact, we’ve dealt with projector fans that were so loud that they could take even the most focused media watcher give pause. Vankyo’s fan suppression not only ensures proper heat dispersion, but does it with minimal sound. We never once felt like the immersive experience was broken because of the Leisure 3’s fan. In fact, if we had not known any better, we would have thought the fan was broken and that the projector was about to explode, leaving shards of plastic and glass shrapnel embedded in our eyeballs. Luckily, the cooling system did its job without throwing it in our face like some sort of fancy-pants. We want to include a section on the included storage bag, just because it’s such a welcome addition to the product experience. We’ve never reviewed a mini-projector that included its own carrying, so we have to give Vankyo some major props. They get even more points for making the bag such a perfect receptacle for all of the necessary hardware and accessories, and not merely a hastily designed storage source. The bag features straps which keep the projector snug and secure, much like a premium laptop bag. A mesh inner pouch is perfect for carrying around the user manual or any other small objects you’d like to include. Vankyo has also included plenty of room for the remote control and all the necessary cables. Including a storage bag was unnecessary, yet they still chose to make the addition, and it vastly improves the user experience. Affordable and well-functioning mini-projectors are hard to come by, and the Vankyo Leisure 3 is both. Other than a few caveats, such as the lack of support for Dolby digital sound and the necessity for a low-lit room, the device is a completely capable piece of machinery. Building an entertainment system is hard if you’re living on a tight budget, but just because you’re broke, shouldn’t mean you have to miss out on one of the greatest joys in life, which is sitting down with a bunch of friends and enjoying a movie on the big screen.